Last week saw a dispute over Jerusalem at the Democratic National Convention that, in the context of similar incidents, provides an important insight into the party's covert distancing of itself from Israel. The story broke on Sept. 4, when the Washington Free Beacon reported that "Jerusalem is unmentioned" in the 2012 Democratic Party platform. This made news because, since it became U.S. law in 1995 that "Jerusalem should be recognized as the capital of the State of Israel," every platform of both major U.S. parties has reiterated this point. The Republican platform this year, for example, refers to "Israel with Jerusalem as its capital." Responses to the Democrats' silence came swiftly: Jennifer Rubin in the Washington Post called it "the most radically unsupportive statement of policy on Israel by any major party since the founding of the state of Israel." Nathan Diament of the (Jewish) Orthodox Union found it "extremely disappointing." Paul Ryan called the omission "tragic." Mitt Romney (who referred to "Jerusalem, the capital of Israel" recently while standing in Jerusalem itself) rued that the entire Democratic Party embraced Obama's "shameful refusal to acknowledge that Jerusalem is Israel's capital." Democrats acted no less swiftly. The next day, Sept. 5, delegates at the Democratic National Convention were told that "President Obama recognizes Jerusalem as the capital of Israel, and our party's platform should as well." Los Angeles mayor Antonio Villaraigosa asked them, by voice vote, to approve by 2-to-1 an amendment to the platform along these lines, as well as another amendment. DNC Parliamentarian Helen T. McFadden instructed Villaraigosa, "You've got to rule and then you've got to let them do what they're going to do." Right before he begins to speak, she repeats her order: "Rule!" Then, in the only unscripted moment of the convention, the nays resounded as loudly, if not more loudly, than the ayes. 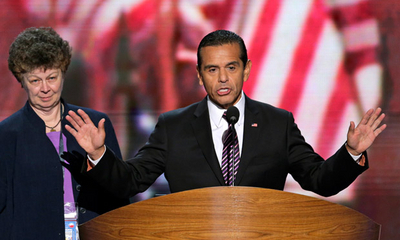 A puzzled looking Villaraigosa asked for a second voice vote and got the same result. As he appeared unsure what to do, Parliamentarian Helen T. McFadden approached and instructed him, "You've got to rule and then you've got to let them do what they're going to do." Dutifully, he asked for a third vote. Again, the nays at least matched the ayes. But this time Villaraigosa read his teleprompter instructions and stated that "in the opinion of the chair, two-thirds having voted in the affirmative, the motion is adopted." Cheated of a victory, anti-Israel delegates booed. 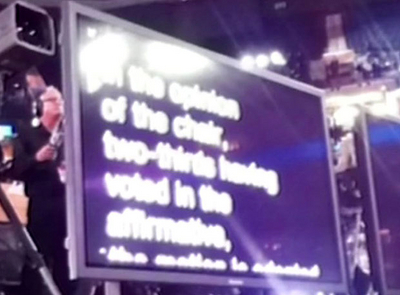 The DNC teleprompter contained the phrase "in the opinion of the chair, two-thirds having voted in the affirmative …" meaning that, regardless of the actual voice vote, the convention chairman had orders to add Jerusalem to the party platform. Harvard's Alan Dershowitz dismissed the boos as coming from "rogue elements." Sen. Charles Schumer (Democrat of New York) declared that "everyone knows" the "vast, overwhelming majority" of Democrats favor Jerusalem as the undivided capital of Israel. In contrast, anti-Israel activist James Zogby declared victory for his side: "When I hear all the boos, … [it] means we're not isolated on the margins of American politics anymore." Which interpretation is right? Neither. Dershowitz and Schumer are wrong to deny that anti-Israel forces are gaining ground in a party increasingly warm to Islamists and boasting a president whose understanding of the Middle East is, as the National Review puts it, "more Edward Said than Bernard Lewis." Fact is, party delegates split evenly on Jerusalem as Israel's capital. But, contrary to Zogby, Obama's needing personally to intervene and change the platform signals how broadly the American public supports Israel and that coolness to Israel hurts in national elections. Anti-Israel boos coming from Democratic delegates will do damage with voters; tellingly, the Romney campaign plans to rebroadcast this incident - which the New York Sun rightly calls "the defining story of the [Democratic] convention" - in campaign ads. 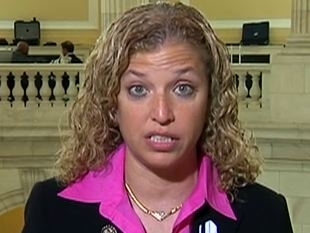 Debbie Wasserman Schultz, caught out fabricating twice last week on the topic of Israel. Democratic National Committee Chair Debbie Wasserman Schultz last week accused the Washington Examiner of "deliberately" misquoting her about the Israeli ambassador having said Republicans are "dangerous for Israel"; in fact, she lied twice - fabricating the ambassador's statement and then denying what she had said about him. A National Jewish Democratic Council video, "What Do Israelis Think of Obama?" actually doctored anti-Obama statements by Israelis, making them into pro-Obama ones. The White House re-labeled picture captions a year ago to remove their use of an offending phrase, namely "Jerusalem, Israel." Democrats pretend to be pro-Israel (for electoral reasons) even as they cool to the Jewish state (for ideological reasons). Their distortions are becoming increasingly ineffectual, blatant, and squalid. Sep. 11, 2012 updates: (1) Compounding two of the deceits above, asked on CNN about the amendment debacle, Debbie Wasserman Schultz insisted on their being only "a smattering of opposition." Someone get her a hearing aid, quick. (2) Another example of distortion, though this one tied to Americans for Peace Now, not the Democratic Party: Lara Friedman, the head of APN, just sent out a jaw-dropping fundraising appeal. On the cover one finds this quote: "Sometimes the [George] Zimmermans of the world turn out to be Jewish and/or Israeli. Their actions bring shame to all of us and are a stain on our community, our religion, and the Jewish state." (The whole analysis can be found in a July article by Friedman, "Where's the Shame?") Phyllis Chesler dissects this outrage in "Lara's Lies - Or How Peace Now Sees the IDF." Related Topics: Conservatives & Liberals, Israel & Zionism, Jerusalem | Daniel Pipes receive the latest by email: subscribe to the free mef mailing list This text may be reposted or forwarded so long as it is presented as an integral whole with complete and accurate information provided about its author, date, place of publication, and original URL.